Many scholars see this passage as a creation of the early church due to the fact that Psalm 110 was the principle text associated with the church’s emerging Christology. Yet, despite the psalm’s popularity in early Christianity, such a conclusion is unwarranted. Let’s look at the evidence. First, since both the Davidic psalms and Daniel 7 were interpreted eschatologically in ancient Judaism, there is no reason to suppose Jesus, understanding himself as the messiah, could not have seen these texts as referring to himself. If non-Christian Jewish rabbis could tie the two passages together there is no reason to insist Jesus could not have. Moreover, scholars have also pointed out that the depiction of the “son of man” sitting next to God on a “throne of glory” in the Similitudes (1 En. 45:3; 55:4; 62:5) also seems indebted to a combination of imagery from Daniel 7 and Psalm 110. Suffice it to say, there is no reason to believe Jesus could not have spoken thus. Indeed, texts which we have seen are likely authentic demonstrate that Jesus similarly combined other passages (cf. e.g., Matt 11:5//Luke 7:22; Matt 21:13//Mark 11:17//Luke 19:46). More than any other passage, this psalm is used by writers of New Testament books to explain Jesus’ identity and role (cf. e.g., Acts 2:34–35; Rom 8:34; 1 Cor 15:25; Eph 1:20; Col 3:1; Heb 1:3, 13; 8:1; 10:12). In particular the language here finds a close similarities with those attributed to the earliest Christian martyr, Stephen, in Acts 7:56: “Behold, I see the heavens opened, and the Son of man standing at the right hand of God.” However, an interpretation which sees the statement made by Jesus as a re-working of Stephen’s speech, it should be pointed out that Stephen’s language lacks the Semitic flavor of Jesus’ words (i.e., the reverential circumlocution for God, “the Power” / τῆς δυνάμεως). This would seem to make it more difficult to see Stephen’s saying as more ancient than Mark 14:62 and par. Other charges also leveled against the historicity of this episode have also been dealt with by others, most effectively by Bock, Blasphemy and exaltation in Judaism and the Final Examination of Jesus, 209–33. For example, some have made the claim that the passage cannot be historical because the charge of blasphemy depends upon Christological implications of Jesus claim which were produced by the early Church, e.g., “the Messiah” is linked with “Son of God” language. See, e.g., Maurice Casey, From Jewish Prophet to Gentile God (Louisville: Westminster/John Knox Press, 1991), 54. However, as Betz has demonstrated, the language here also closely mirrors 2 Samuel 7 and 4Q174. See Otto Betz, “Die Frage nach dem messianischen Bewusstsein Jesu,” NovT 6 (1963) 20–48; Davies and Allison, Matthew, 3:531. Have you seen recently in a news article they found evidence that maybe the Bible might be older then they thought? Scholars merely assert that Jesus could not have said this. They have no proof to assert anything either way. You either believe the accounts or you don't. I am one of the attendees of the Riverside Bible Conference you spoke at on January 22 - 23, 2010. The subject of Jesus's words before Caiaphas was part of a very short discussion I had with you at that conference. As at best a lay amateur in biblical scholarship, it seems to me that the recent work of many scholars from many different areas of study involving biblical and second temple Judaism all point to these words of Jesus being authentic and entirely commensurate with the Judaism of his day - regardless of what the Historical Jesus industry might say. For example, Robin Griffith - Jones ("The Gospel of Paul") essentially says that Jesus, Paul, and the early Christians were deeply involved in Merkavah mysticism, at least with respect to the idea of ascent to the chariot throne and the cosmic temple of which the earthly temple was a copy. Rachel Elior (The Three Temples) - while presenting rather unconventional views about the non-existence of the Essenes - also argues for the mystical service of the "Sons of Zadok" in the heavenly temple (cf. Book of Hebrews) as an alternative to the corrupted services of the Jerusalem temple. These views are all echoed and wonderfully summarized in a paper written by April D. DeConick, "What is Early Jewish and Christian Mysticism?" Add to these the classic work of Gershom Scholem and the ruminations of more recent and popular authors, such as Chilton in his "Rabbi Jesus," we seem to get a growing consensus that the Daniel 7:13 language of Jesus before Caiaphas fits well into the first century cultural milieu. If we accept that conclusion, then the argument for Jesus authentically connecting the messianic Psalm 110 and the apocalyptic Dan 7:13 is that their connection in Jesus's response to Caiaphas is the BEST EXPLANATION for the Sanhedrin handing Jesus over to Pilate (outside of the completely cynical view that the Sanhedrin acted arbitrarily and solely for political reasons). 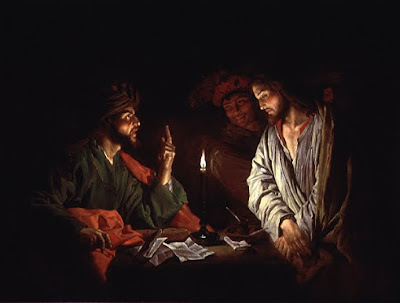 It seems to me (as an amateur) that had Jesus acknowledged ONLY his messianic claim, Caiaphas could not have convinced the Sanhedrin to hand Jesus - a fellow Jew - over to Pilate. But, Jesus went beyond the messianic claim - in one of the Gospels, I believe Jesus responds to Caiaphas with, "The words are yours; and you will see the Son of man seated at the right hand of Power, and coming with the clouds of heaven," meaning (I take it) that "You ask if I am your understanding of the messiah, but I am more...I am the Image of God that sits on the chariot throne." It was this clear reference to the throne chariot rider of Ezekiel, Daniel, and Enoch that made Caiaphas tear his robes and declare that blasphemy had been committed in his very presence. So, handing Jesus over to Pilate would not have been a problem. The connection of Psalm 110 and Daniel 7:13 in Jesus's response is the BEST EXPLANATION for the Sanhedrin handing Jesus over to Pilate. Jim West Hangs It Up?